With that explanation, it’s easy to understand why Jacqueline Hart chose to go directly into the tax department at Ernst & Young (EY) right after graduating from college. “The exposure to C Corp., pass-through (S Corp. & LLC), individual, and trust taxation was invaluable,” she explains. But Hart, currently corporate tax director at Aetna Inc., didn’t go directly from EY to the insurance giant. There were a few twist and turns. First, as luck would have it, one of her clients at EY was a family who owns of one of the largest privately held companies in Buffalo, New York, Rich Products Corp (Rich’s). So when an opportunity arose to work in the corporate tax department at Rich’s, Hart seized the moment. “Instead of worrying about public accounting time sheets and jumping from one client to another, I enjoyed being able to focus on a dedicated group of entities while collaborating with other areas in the organization, including the executive team, finance, business development, IT, HR, legal, payroll, operations, and facilities,” she says. Then, in an effort to expand her career, Hart took a risk, leaving Rich’s to start the corporate tax function at Prodigy Health Group. Previously, all tax work was outsourced to CPA firms, but due to exponential growth via acquisitions, the function was being developed in-house. “At the time, I was the only dedicated tax person, which was a challenge, but I found this role to be extremely rewarding. I was responsible for all aspects of corporate tax, such as audits and risk management, compliance, planning, provision, credits and incentives, and mergers and acquisitions. I became a value-added business partner within the company and created policies and processes that previously never existed,” she explains. After a few years, Prodigy Health Group was acquired by Aetna Inc. In addition to being a member of the transaction team with responsibility for all tax aspects of the sale, Hart also led the tax function integration of the Prodigy group of entities into Aetna. 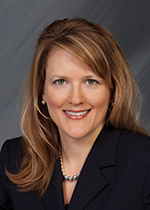 Eventually, she took on a role within the multistate area of Aetna’s large and dynamic tax department, and now she focuses on consolidated federal income taxation for all Aetna entities. No two days at Aetna are ever the same. “We are in the midst of great and exciting changes in our industry,” Hart notes. In July 2015, Aetna announced a plan to acquire Humana in the second half of 2016, pending regulatory approval. “This will be a once-in-a-lifetime opportunity to be involved in the integration of a Fortune 100 company into a Fortune 50 company,” she says. Her biggest challenge is working remotely from her team. She lives near Buffalo, New York; Aetna is based in Hartford, Connecticut. “We have been effective in developing and maintaining a successful multisite department (not only for myself, but also for others who are not based in Hartford) by utilizing all available technology (email, instant messaging, being a completely paperless department, etc. ),” she explains. Key Achievements: My family. I am extremely proud to be called “Mom” and to be able to successfully manage my family’s busy schedule as well as a fulfilling career. One Interesting Tidbit: Our daughter was the first baby born in the Buffalo area on Mother’s Day the year she was born. (It happened to be my birthday weekend as well.) Two local television news channels interviewed us that morning, and before we were even able to contact many family and friends, they learned that we had the baby while watching the news! So proud to not only know you and your family, but also to be related. Congratulations on all of your achievements. What a nice article. Peggy shared it with me.